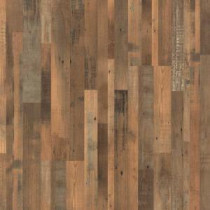 Pergo XP Reclaimed Elm is a multi-width design with interesting paint and distressing marks. The soft toasted grey brown color is accentuated with amber undertones. The all over ticking with satin finish gives a subtle gloss to the surface. Installation is quick and easy using the patented click joint technology while providing a secure fit. This product features a limited lifetime residential warranty and 5-year light commercial warranty which guarantees the top layer against wear through, staining or fading. 22.09 sq. ft. per case. Case quantity: 9. Case weight: 33.6 lb. Buy online Pergo XP Reclaimed Elm 8 mm Thick x 7-1/4 in. Wide x 47-1/4 in. Length Laminate Flooring (22.09 sq. ft. / case) LF000851, leave review and share Your friends.